Base class for generating GraphViz output. The G template parameter is the type of graph for which output is being generated. G must be a Sawyer::Container::Graph type. Definition at line 137 of file GraphViz.h. Definition at line 142 of file GraphViz.h. Definition at line 145 of file GraphViz.h. Definition at line 148 of file GraphViz.h. Construct a GraphViz emitter having an empty graph. The graph method can be called to give the emitter a new graph later. Definition at line 178 of file GraphViz.h. Construct a generator for the specified graph. The graph is copied into this generator. Definition at line 183 of file GraphViz.h. Definition at line 189 of file GraphViz.h. Referenced by Rose::BinaryAnalysis::Partitioner2::GraphViz::BaseEmitter< ControlFlowGraph >::BaseEmitter(). Attributes that should apply to the graph as a whole. Definition at line 204 of file GraphViz.h. Definition at line 207 of file GraphViz.h. Property: default graph node attributes. Attributes that should apply to all graph nodes. Definition at line 217 of file GraphViz.h. Definition at line 220 of file GraphViz.h. Property: default graph edge attributes. Attributes that should apply to all graph edges. Definition at line 230 of file GraphViz.h. Definition at line 233 of file GraphViz.h. Property: Controls which vertices are to appear in the output, and how. Each vertex of the graph has an entry in this table, and the entry describes such things as whether the vertex will be present in the GraphViz file, which subgraph (if any) it will belong to, its label, and other attributes. Most GraphViz-emitting methods modify this information and then call the basic emit method. In general, if the user supplies a label or attribute prior to such calls then that information is used instead of calculating new information. Definition at line 255 of file GraphViz.h. 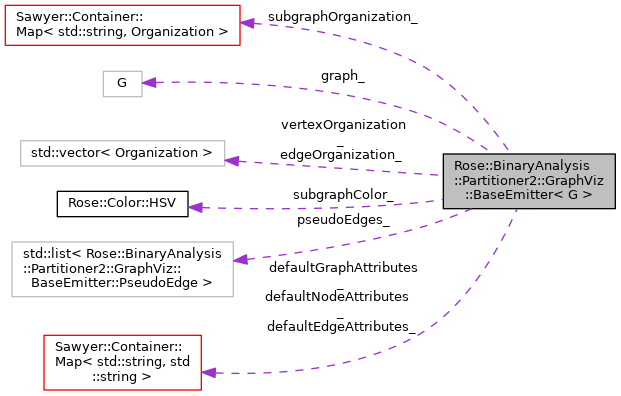 Referenced by Rose::BinaryAnalysis::Partitioner2::GraphViz::BaseEmitter< ControlFlowGraph >::vertexOrganization(). Definition at line 258 of file GraphViz.h. Definition at line 261 of file GraphViz.h. Definition at line 265 of file GraphViz.h. Definition at line 269 of file GraphViz.h. Definition at line 272 of file GraphViz.h. Definition at line 275 of file GraphViz.h. Definition at line 278 of file GraphViz.h. Property: Controls which edges are to appear in the output, and how. Each edge of the CFG has an entry in this table, and the entry describes such things as whether the edge will be present in the GraphViz file, which subgraph (if any) it belongs to, its label, and other attributes. Definition at line 293 of file GraphViz.h. Referenced by Rose::BinaryAnalysis::Partitioner2::GraphViz::BaseEmitter< ControlFlowGraph >::edgeOrganization(). Definition at line 296 of file GraphViz.h. Definition at line 299 of file GraphViz.h. Definition at line 303 of file GraphViz.h. Definition at line 307 of file GraphViz.h. Definition at line 310 of file GraphViz.h. Definition at line 313 of file GraphViz.h. Definition at line 316 of file GraphViz.h. Property: Controls which subgraphs appear in the output, and how. Each subgraph has a distinct name consisting of only letters, numbers, and underscores. The table contains information about whether the subgraph is selected for output, its label, and other attributes. Definition at line 331 of file GraphViz.h. Definition at line 334 of file GraphViz.h. Definition at line 337 of file GraphViz.h. Definition at line 340 of file GraphViz.h. Causes all vertices and edges to be selected. Causes all vertices and edges to be selected as the core part of the graph. If b is false then all vertices and edges are deselected instead. Definition at line 349 of file GraphViz.h. Deselects all vertices and edges. Definition at line 355 of file GraphViz.h. Causes all vertices to be selected. Causes all vertices to be selected as the core part of the graph. If b is false then all vertices are deselected instead. Definition at line 365 of file GraphViz.h. Referenced by Rose::BinaryAnalysis::Partitioner2::GraphViz::BaseEmitter< ControlFlowGraph >::selectAll(), and Rose::BinaryAnalysis::Partitioner2::GraphViz::BaseEmitter< ControlFlowGraph >::selectNone(). Causes all edges to be selected. Causes all edges to be selected as the core part of the graph. If b is false then all edges are deselected instead. Definition at line 374 of file GraphViz.h. Deselect all but one parallel edge. For parallel edges between a pair of vertices, all but one is deselected. Which one remains selected is arbitrary. Definition at line 998 of file GraphViz.h. Dump selected vertices, edges, and subgraphs. This is the most basic emitter that produces an entire GraphViz file. The graph will contain the selected vertices and edges organized into subgraphs according to the vertex, edge, and subgraph organization information. Definition at line 930 of file GraphViz.h. References Rose::BinaryAnalysis::Partitioner2::GraphViz::escape(), Sawyer::Container::Map< K, T, Cmp, Alloc >::exists(), Sawyer::Container::Map< K, T, Cmp, Alloc >::insert(), Rose::BinaryAnalysis::Partitioner2::GraphViz::Organization::isSelected(), Rose::StringUtility::numberToString(), Rose::BinaryAnalysis::Partitioner2::GraphViz::Organization::subgraph(), and Rose::BinaryAnalysis::Partitioner2::GraphViz::toString(). Emit a single vertex if it hasn't been emitted already. In any case, returns the GraphViz ID number for the vertex. Definition at line 894 of file GraphViz.h. References Rose::BinaryAnalysis::Partitioner2::GraphViz::Organization::attributes(), Sawyer::Container::Map< K, T, Cmp, Alloc >::getOptional(), Rose::BinaryAnalysis::Partitioner2::GraphViz::Organization::isSelected(), Rose::BinaryAnalysis::Partitioner2::GraphViz::Organization::label(), Rose::BinaryAnalysis::Partitioner2::GraphViz::Organization::name(), Rose::BinaryAnalysis::Partitioner2::GraphViz::NO_ID, Rose::StringUtility::numberToString(), Sawyer::Container::Map< K, T, Cmp, Alloc >::size(), and Rose::BinaryAnalysis::Partitioner2::GraphViz::toString(). The vertices must have been emitted already. Definition at line 910 of file GraphViz.h. References Rose::BinaryAnalysis::Partitioner2::GraphViz::Organization::attributes(), Sawyer::Container::Map< K, T, Cmp, Alloc >::exists(), Rose::BinaryAnalysis::Partitioner2::GraphViz::Organization::label(), Rose::StringUtility::numberToString(), and Rose::BinaryAnalysis::Partitioner2::GraphViz::toString().